Balancing blogging and having a new baby has definitely been interesting. I didn't know if I would want to spend much time blogging once he was here, but I've learned that it still is such a creative outlet for me, and I enjoy the time I can sneak in to write + share. This list of 5 things are the things that we use every. single. day. And these are the things I would recommend for any new parents. 1. Rock and Play (you can find this one at Target) Luke sleeps in this next to our bed and really loves it. We tried putting him in the pack and play when he was first born, but he kept waking up. He sleeps much better with the little incline :) Plus, it's easy to move around the house and ready for travel. 2. Aden and Anais swaddle blankets. Light. Big. Soft. We were gifted a lot of blankets (which are all nice), but these are the go-to blankets. Plus, they are super cute! 3. Lanolin. If you end up breastfeeding, this stuff is a life-saver. Breastfeeding hasn't been easy as pie for me, so this cream has helped heal and protect. I still use it religiously. 4. Britax B-Agile stroller and carseat. We love how easy it is to use and lightweight it is. I often click in the carseat to the stroller for a quick trip into a store or when I don't want to lug a carseat around. 5. Bunn coffee maker. Fast. Enough said. I don't drink a lot of coffee, but I need at least one cup in the morning to get me started. Of course, we use all the basics daily--diapers, wipes, etc. But, these items are things I've been extra thankful to have during these last few weeks. I already have 2 of your items, those swaddling blankets and lanolin :) I can't wait to drink real coffee again. thanks for linking up! 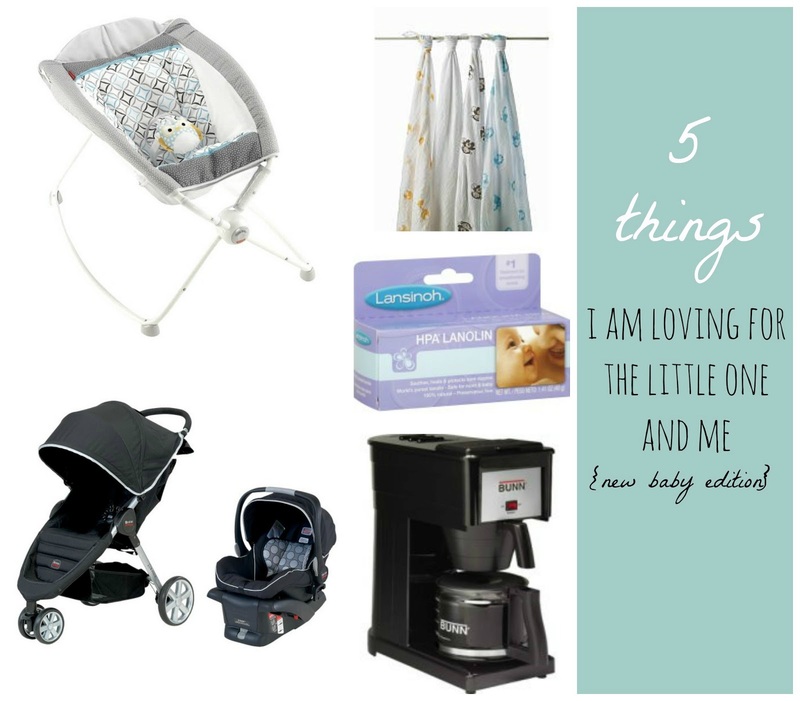 i'll have to hold onto this list when I become a mom someday! Aden + Anais swaddling blankets are what I get for every new mom now. Love them, especially for a summer baby. Hope you're settling in well with Luke!